Today, I am proud to present the Mayor’s Office of Data Analytics’ 2018 Year in Review and Look Ahead, which highlights key projects from 2018 and opportunities on the horizon in 2019. Since I joined City government in October, I have had the privilege to speak with countless New Yorkers, from agency commissioners to passionate data scientists at local non-profits. Many were curious to learn what my priorities as Chief Analytics Officer would be. To this I replied: your priorities are my priorities. My first four months with the City have been dedicated to listening and understanding. Indeed, the tradition of the Mayor’s Office of Data Analytics has been to understand the challenges and opportunities facing New York City agencies and the New Yorkers they serve. When the City rolled out Universal Pre-K, we helped enrollment specialists decide which households to prioritize in outreach efforts. When Legionnaires’ disease struck the Bronx, we helped City leaders decide where to send resources to register cooling towers. When the City’s special task force for tenant harassment targets bad landlords for inspection and enforcement, we help inspectors decide where to look first. And though our office has existed for years, in December we had the rare honor of being written permanently into the New York City Charter, ensuring that we will continue to use data and analytics to push toward a fairer, more equitable City for many years to come. None of this progress would be possible without MODA’s passionate and talented team of data scientists and technologists, or the energy and support of our collaborators across City government and the civic tech community. I am inspired by their unwavering commitment to make life better for New Yorkers every day, and thank them for their continued service to the City. In December 2018, the Mayor’s Office of Data Analytics (MODA) was permanently codified in the New York City Charter with the ratification of Local Law 222 of 2018. Local Law 222 establishes seven charter mandates for MODA, reflecting the office’s responsibilities for data analytics and data sharing, and marks the first time a major city has codified a data analytics office into law. Kelly Jin took the helm as the City of New York’s Chief Analytics Officer and Director of the MODA. Faraz Ahmed and statistician Shira Mitchell joined as data scientists, adding to MODA’s current roster of data scientists, Deena Patel and Ryan Zirngibl. Adrienne Schmoeker was promoted to Deputy Chief Analytics Officer, Craig Campbell to Assistant Director for Policy and Operations, and Mitsue Iwata to Strategy and Analytics Advisor. The 2018 annual update on Open Data for All and the NYC Open Data Plan reported that 38 City agencies published 629 new datasets, including 38 new automations, in Fiscal Year 2018. The report also featured the 200+ civic engagement commitments made by over 60 agencies and offices, from producing curricula on how to analyze their data to advertisingNYC Open Data on their social media accounts. These commitments add to existing efforts to bring public data to life — including a video PSA, LinkNYC campaigns, and the Open Data Project Gallery — by telling stories of how New Yorkers encounter and analyze the public data powering City operations every day. 2018 also marked record engagement for NYC Open Data, online and in-person. The platform welcomed 1.2 million visitors, who viewed over 6 million pages. Three sold-out Learning About New York City events, co-hosted by MODA and Esri at Civic Hall, showcased how City agencies collect, publish, and use data to deliver services to New Yorkers. The Open Data team celebrated the 2nd Annual Open Data Week, which brought 1,800 New Yorkers to over 30 events, from a data art exhibition, an open contracting treasure hunt, a tour of a data exhibit at the Museum of the City of New York, and workshops for student entrepreneurs on how to use open data to build business. As part of the Metadata for All initiative — a partnership with the Sloan Foundation, Tiny Panther Consulting, Pratt Institute, New York Public Library, Brooklyn Public Library, Queens Public Library, and The METRO Library Council — New York City librarians assessed the usability of the metadata for the 100 most viewed datasets on NYC Open Data. They developed a guide for Open Data Coordinators and a new standard for NYC Open Data metadata, designed to increase usability and interpretability of agency data. All new datasets published on the platform will adopt the new “Metadata for All” standard starting February 2019. 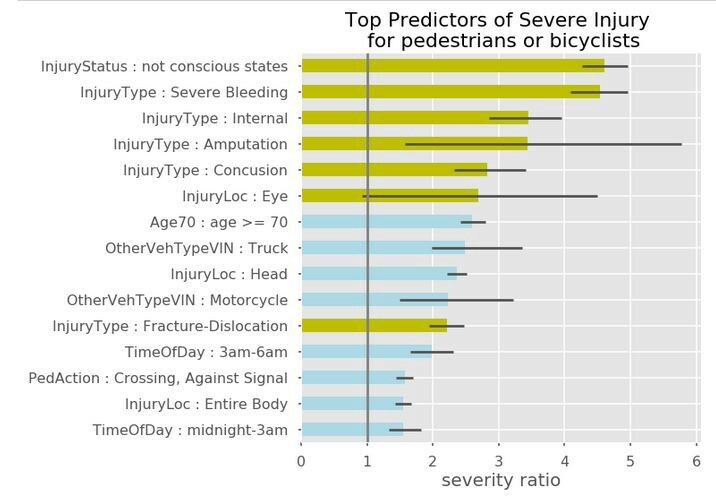 To support the administration’s Vision Zero Task Force and its goal to end traffic deaths and injuries on New York City streets, MODA analyzed linked hospital records and NYPD crash data to identify which types of crashes are more injurious to pedestrians. The analysis confirms that the Department of Transportation’s formula for assigning severity to pedestrian crashes, which relies on ratings reported by police officers at the scene of a crash, largely aligns with injury outcomes reported by hospitals. However, some improvement is possible, and MODA developed two methods that improve upon the current formula. In addition, the analysis found that older adults are more vulnerable on city streets: pedestrians over age 70 who were involved in a crash were 2.5 times more likely to sustain severe injuries. Additional details are available on MODA’s GitHub account. A full case study will soon be published on the MODA Project Library, which features write-ups of MODA data science projects, including data used and source code where applicable. In December 2017, MODA launched the Analytics Exchange (AnEx), a community of practice for data analysts across City agencies that has since grown to over 300 members. AnEx convenes each quarter and has so far hosted five events on City data systems and analytics projects, and collaborated on shared issues facing data analysts across the City. In December 2018, AnEx celebrated its one year anniversary with a fireside chat between Chief Analytics Officer Kelly Jin and Department of Information Technology and Telecommunications Commissioner Samir Saini. The Automated Decision Systems (ADS) Task Force, established by Local Law 49 of 2018, is charged with developing and recommending a process for the responsible use of “automated decision systems” in New York City government agencies. MODA serves as a strategic advisor on the Task Force, providing domain expertise on City agency needs, civic tech and algorithmic ethics communities, and responsible analytics. Upcoming events. Join MODA and five City agencies on Tuesday, February 5 for Learning About NYC: Public Safety at Civic Hall, and follow this page for updates on NYC Open Data Week 2019, which will take place March 2–9, produced in collaboration with BetaNYC and the NYC Department of Information Technology and Telecommunications. How MODA Works: Open Analytics and Analytics Playbook. MODA will continue to work in partnership with City agencies on analytics projects, opening more of its methodology and code online than ever before. This year, MODA will also publish an Analytics Playbook, a guide to approaching and scoping analytics projects with details on MODA’s end-to-end project lifecycle. More opportunities to engage. The Chief Analytics Officer will host regular, public office hours at Civic Hall, and the team will host open Lunch à la MODA sessions featuring data leaders from City agencies, academic institutions, non-profits, and the private sector. Defining the future of Open Data. In 2019, NYC Open Data users can expect a program and platform that is governed more collaboratively, including a first-of-its-kind Open Data Advisory Council and Youth Leadership Council. NYC Analytics Ecosystem Research: MODA launched the “NYC Analytics Ecosystem Research Project” in 2018 to generate insight on how to best structure, staff, and manage analytics teams in local government agencies. The team will publish a white paper this summer on its findings.